It looks gorgeous. Great job. This looks delicious. I am such a huge fan of coconut. I finally saw a sign for young coconut at our local store and I got all excited and when I reached down they were all gone. I was so bummed. But there's hope. They do exist and sooner or later I will get ahold of one. Coconut is one of my favorite flavors! These cupcakes are too cute! I will bet these are awesome as they look I love mounds candy bars, so this ones for me! I love coconut. Such interesting information. Thanks for sharing. LOVE your cupcakes. I love coconut cupcakes and your history is incredibly detailed...I love the idea of a shipwreck planting the palms in Florida (being a floridian that's pretty cool). Glad to see that you made a baked good here-it looks delicious. Cakes mixes can be a great time saver-nice flavor choice Yum! So glad coconut made it to America...YUM! Thanks for sharing, Christine! You make my day! Excellent information on coconuts, I enjoyed reading the post. 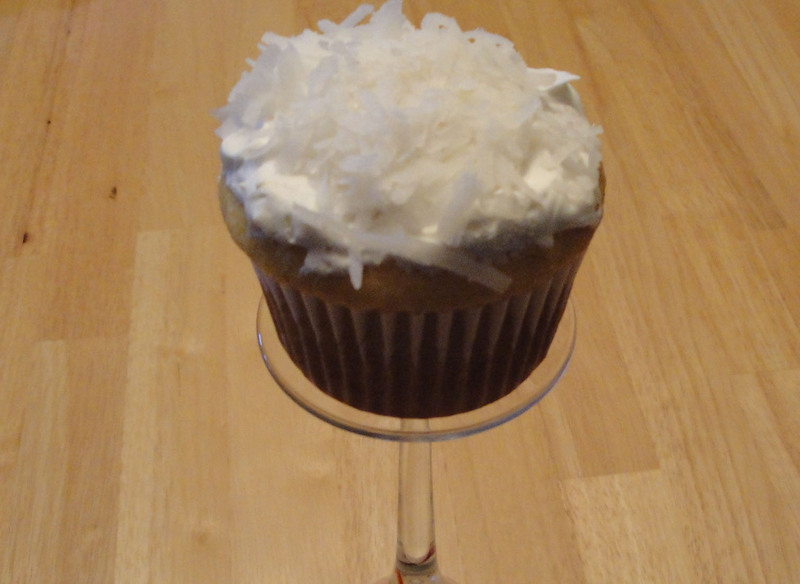 And the coconut cupcakes sure sound scrumptious! Hi Kim Bee, I have not seen young coconut in my local store, but I'll be on the look out. You're right, sooner or later you will get a young coconut. Hi The Glamorous Gourmet, I'm glad coconut made it to America too. Hi Sandi, I agree with you, glad coconut made it to America. Hi Ann, I thought that was pretty cool to. I really enjoy adding coconut to dishes. Unfortunately my husband does not feel the same way. Great cupcakes! Delish! I love how easy these are to make and how tasty they are. Thank you for sharing!!! Looks great! I love coconut!!! Just started a cooking blog....come on over and say 'hi'! Thanks for all the yummy ideas! That topping of coconut on top is so attractive. I bet these cupcakes were amazing! I love coconut, and this recipe looks son yummy! I bet these taste really good! Thanks for sharing! Thanks for following, I'm following back. Only just found your blog, how interesting to provide history with the recipes! These look great. How interesting of the history of coconut, as well as pineapple. I always thought they are origin from the islanders! Great Post, Christine! So interesting about coconut history. And they sound incredible. I LOVE coconut! Very interesting post and delicious looking cupcake!